This scrumptious 'nested egg' and potato casserole makes a great entrée for a weekend breakfast get-together or brunch. Preheat the oven to 350°F (175°C). 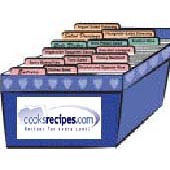 Coat a 13x9x2-inch baking dish with nonstick cooking spray. Heat the oil and melt the butter in a 12-inch nonstick skillet over high heat. Add the hash browns and cook for 15 to 20 minutes, or until they begin to brown, stirring occasionally. Remove from the heat and add the ranch dressing mix, 1/2 cup shredded Parmesan cheese and 1/2 cup mozzarella cheese; mix well then spoon into the baking dish. Make 8 evenly-spaced indentations in the potatoes and break an egg into each. Remove the foil and sprinkle evenly with the remaining 1/2 cup Parmesan and mozzarella cheeses. Bake for 5 to 6 minutes, or until the cheeses melt. Sprinkle with the scallions and serve. From the kitchen of Mr. Food. Recipe provided courtesy of the American Dairy Association.